Custom product shopping is all about personal choices however it is always advisable to seek wise suggestion for selection of imprint colors. A light color should not be printed on to a light colored wristband and same goes for darker shades. The reason is simple - It would be difficult for the user to read the text and understand the design. 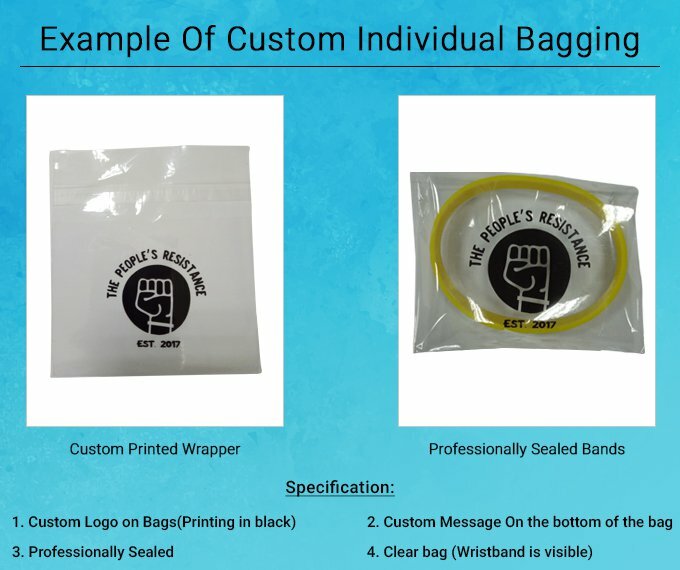 However, the customer can select the colors as per his preference and we would manufacture the desired wristbands without asking any question. The customer is entitled to select the manufacturing, printing and delivering time on the check out page. Further course of timeline of the processes would depend upon the customer's selection. The order would be delivered within the selected time (business days) by adding the days which have been selected for production and shipping. Standard production times are manufacturer dependent however the rush production times can be manipulated by the customer. Depending upon the emergency of the ordered items one can select from the two options. The time for production and delivery is guaranteed in case of rush production however the case may be different due to natural calamities or worse uncontrollable situations. Manufacturer is responsible for speeding up the production if they delay the production time we take appropriate measure to speed up the shipping methods. Our company takes all adequate steps to ensure RUSH or Normal orders gets delivered on or before time. Artwork can either be premade and uploaded online or can be emailed to us after placing the order. Eventually the latest option we have incorporated to upload the artwork is Chat assistance. We offer you free proof before you decide to purchase and a hassle free experience.. simply fill up your order details and at checkout you will get the option of "See Design - Pay later". We will send you the proof once you submit the order along with payment and proof approval link which will allow you to then pay via credit card or PayPal. When uploading artwork you can upload JPG, GIF, PNG but we highly recommend any vector file format like .ai.cdr files. Photoshop PSD files are also acceptable. When sending them through email /chat a PDF, JPG/ GIF/PNG/JPEG/JPG/AI/EPS file will also work. We recommend high resolution artwork for best print results. Our designers work on the artwork very efficiently by resizing them with all collective efforts to make sure we are meeting the benchmark and ultimately customer satisfaction. We are the only company to redesign the artwork since we have in house designers working 24x7. We recommend you to seek permission before using any copyrighted material however if you do not wish to follow then we would not be held responsible for infringement of the copyright under any circumstance. Our primary shipping partners are FedEx/UPS/TNT/DHL/USPS and we go beyond our limits way to deliver the order to our customers. Order history file is maintained for each customer login. One can login into the account using a set of username and password. The previously placed orders would be visible to the customer by navigating through the tabs. A re-order icon needs to the pressed given against the order which needs to be re- placed. The second method is to call us / email us with the previous order number and rest assured. * Text will be max size on bands. * Color of message/logo will be same as bands. * Color of message/logo will be will be same as inside color. * Internal message will always be embossed. * Internal message is slightly raised and that cannot be in different color. * The actual colors will be translucent and cloudy(shade of color you select). * The wristbands will ONLY glow in green color. * This picture is only for reference as the actual band will have random mixing of colors. * Blending/Mixing of 2 or more colors most likely to produce 3rd color, we will not be responsible for it. * Segmented style is more recommended over swirl as the colors are more random & bleeding of color can be noticed. * Quantity less than 100pcs are made by laser cut process,bands made by this process have the text slightly engraved. 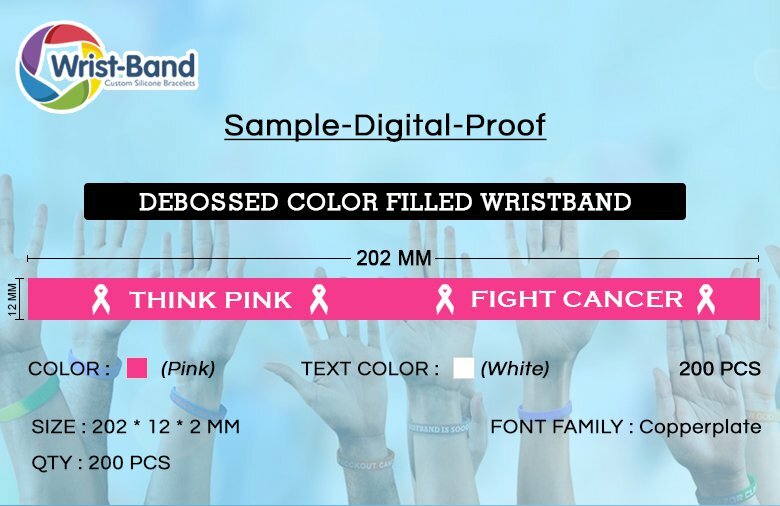 * Free bands are duplicate of the original order and they are evenly distributed among the colors or sizes you order for. * Keychains are for attachment purpose cannot be used as a wrist band. * Custom font will be used. Would you like to change Back Message Style? Closest match to custom colors! Order a Printed wristband (Chosen on Step 1) to get it sooner. The more wristbands you order, the lower your per band shipping cost will be.